Users and caregivers can easily adjust body position and the bed's height with intuitive hand pendant. Maintenance is easy with color-coded junction box connections. Interchangeable bed ends reduce inventory and are washable with standard water pressure. Free Shipping anywhere in the USA or pick up this item today from one of our retail locations (see stock levels above) with an option for curbside delivery. I love this bed. It is soooo much easier than the semi electric bed we had. The brakes actually work, it lifts to a nice angle for feeding Dad in bed, and the control to raise or lower the bed works beautifully. 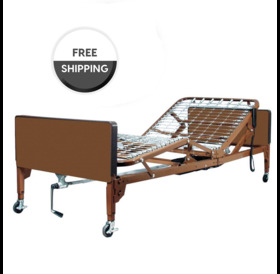 The rails that go with this bed are easy to use too. I wish the Hoyer lift we have didn’t have such high bars at the bottom so we could have the bed fully lowered. The bed itself is wonderful.